The basic gameplay elements are simple, satisfying and work perfectly, partially thanks to an elegant control scheme. The game utilizes digital analog sticks as its primary control method with the entire left portion of the screen capable of acting as your movement and the right as aiming and shooting. Simply hold anywhere on the left side of the screen for the stick to pop up and allow movement and hold the right for your marshal to pull up his gun. Tilting the right stick in a direction aims the gun and firing is either achieved by releasing the right stick for a semi-automatic or continuing to hold it for automatic weapons. Tapping anywhere on the screen causes the Space Marshal to enter stealth / take cover behind obstacles and there’s also a basic UI along the bottom to allow the switching of weapons at a single tap. Missions are primarily of the ‘get from point A to point B’ type but each has specific objectives that must be accomplished along the way that are unique enough to ensure the straightforward gameplay never gets stale. There’s also collectible intel and agrading system to allow for a greater amount of replayability. 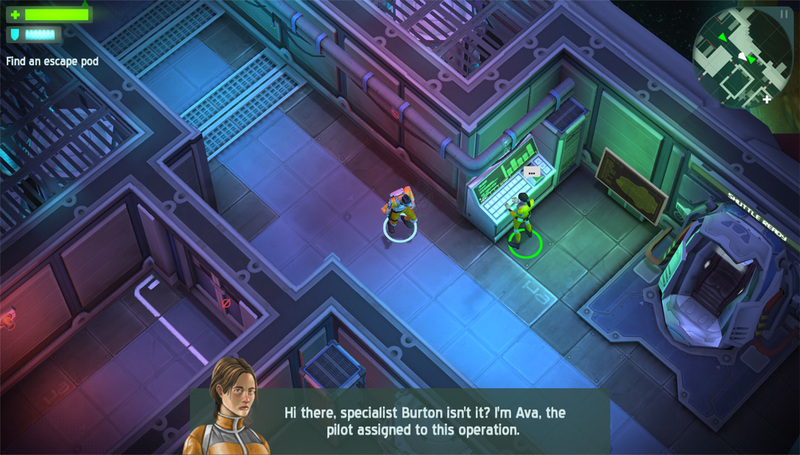 Unfortunately, similarly to Counterspy, Space Marshals often has problems with designing encounters that play to the strengths of its gameplay. You’ll often enter a portion of the environment with enemies placed in ways that force a direct encounter almost immediately, forcibly removing the more tactical elements from the player’s tool belt and shining a harsh light on how unreliable touch controls can be when in a pinch. In these instances I became all too aware of how simplistic the enemy AI was when four of them would insist on sprinting directly at me, guns blazing. Sadly, the game lacks a solid way to effectively dispatch enemies when the player finds themselves surrounded, so running is often the only option considering how squishy the Space Marshal actually is. This only becomes more problematic as the game goes on and begins to introduce massive bullet sponge enemies with ridiculously powerful laser weapons. These weapons do take a moment to charge up, allowing you time to find cover, but if these enemies are just one part of a squad of many then a player death is almost inevitable. There is an intentionally silly little western meets sci-fi plot to go along with the missions but I found it mostly uninteresting thanks to some overly cheeky dialogue and unmemorable characters. But it’s hard to hold that against Space Marshals when the story clearly isn’t the focus. 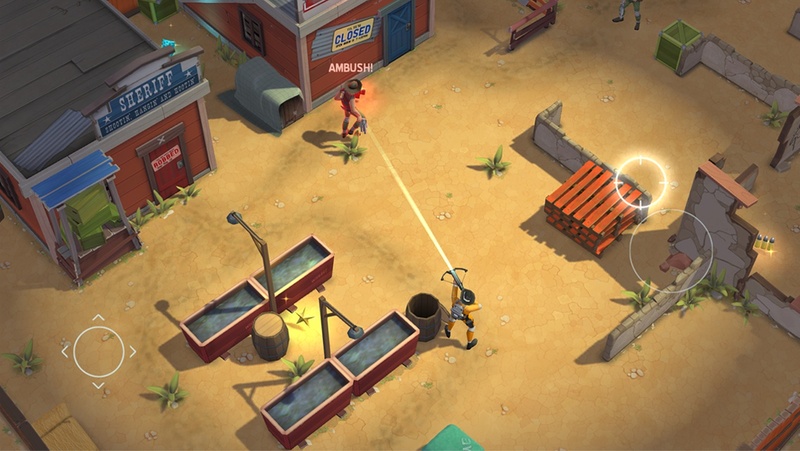 Annoying little issues aside, Space Marshals is a highly enjoyable iOS title that is certainly worth the five dollar asking price thanks to extremely solid gameplay, decent length, and gorgeous visuals.